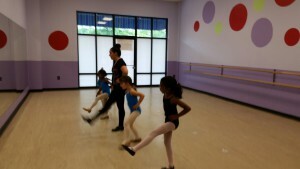 One of the best parts about our tap dance studio in Charlotte, NC is that we welcome all ages to participate. From Fred Astaire to Shirley Temple, there isn’t anything quite like a great tap dancer. Whether you’ve never put on a pair of tap shoes before or you’re a little bit rusty, we want you to come and see us at Carolina Dance Capital in Charlotte, North Carolina. At our tap dance studio, we can teach you how to become a tap dancer like one of the greats. One of the best parts about our tap dance studio is that we welcome all ages to participate. We offer classes for dancers as young as two to three-years-old, all the way up to adults. We want all of our dancers to feel comfortable at our studio, and to most importantly have a good time while they’re dancing with us. All of our tap dance classes are taught by instructors who love tap dancing as much as you do. When you take a class at our tap dance studio, you’ll learn all of the techniques you need to build a solid tap dancing foundation. You’ll also learn specialized choreographed dances that you can show off to your friends or at an upcoming dance recital. If you’re ready to get into tap dancing, at Carolina Dance Capital, we can’t wait to have you come and dance with us at our tap dance studio! Contact us today to find out more about our classes, when they’re held, and why you should come and dance at our studio. We look forward to hearing from you. At Carolina Dance Capital, our tap dance studio welcomes students from Charlotte, Matthews, Weddington, Waxhaw, Gastonia, and Pineville, North Carolina, as well as Fort Mill and Rock Hill, South Carolina.